(21412.B18.123, Z. P. Meyers/Barney Hillerman Photographic Collection, OHS). Incorporated at Bartlesville in 1917, the Phillips Petroleum Company was headquartered there for eighty-five years. In 2002 Phillips, Oklahoma's then-largest company, and Conoco, Inc., merged to become ConocoPhillips and relocated to Houston, Texas. This new, international, diversified energy firm is presently the third-largest integrated energy company, and the second largest refiner, in the United States. The history of Phillips Petroleum Company illustrates the development of the U.S. oil industry. The company began in Bartlesville with the exploits of two brothers, Frank (1873–1950) and Lee Eldas "L. E." (1876–1944) Phillips, who both entered the oil business in 1903. In September 1905 they drilled their first gusher, the Anna Anderson Number One, located northwest of Dewey in the Cherokee Nation, Indian Territory, on land leased from an eight-year-old Delaware Indian girl. The brothers continued to develop oil property, but they became increasingly attracted to banking. First, they organized the Citizens' Bank and Trust in Bartlesville and then purchased the Bartlesville National Bank, merging the two in 1911. Banking's relative stability, compared to the volatility of the oil business, motivated the brothers to switch to banking in 1915. After the outbreak of World War I, however, the oil business began to boom, and they reconsidered their decision. They consolidated their oil holdings and incorporated the Phillips Petroleum Company on June 13, 1917. The new enterprise had assets of about $3 million, twenty-seven employees, and operations in Oklahoma and Kansas. After discovery of Texas's huge Panhandle gas field in 1918 and the Hugoton Field to its north in Kansas, Phillips became increasingly involved in the rapidly developing natural gas industry. In particular, the company specialized in extracting liquids from natural gas and by 1925 was the nation's largest producer of natural gas liquids. The company entered the refining and retail gasoline business to profit from the rapidly increasing demand for automobile fuel. In 1927 Phillips opened its first refinery, near Borger in the Texas Panhandle. On November 19, 1927, it opened its first gasoline service station, in Wichita, Kansas. Because this station lay near the new U.S. Highway 66, the company used "66" in its name. Then, in 1930, Phillips began using the U.S. highway shield as its logo, making the brand easily recognizable across the nation. The onset of the Great Depression caused the company to post its first loss, $5.7 million, and its stock price fell from thirty-two dollars to three dollars per share. Industry expansion slowed as the federal government sought to limit oil production, and the Interstate Oil Compact Commission (1935) sought to bring efficiency and stability to the industry. World War II helped to propel the oil industry out of those economic doldrums by stimulating a dramatic increase in demand. Phillips made important contributions to the war effort, particularly through innovations in the production of "cold" synthetic rubber and development of the HF alkylation process for high-octane aviation gasoline. 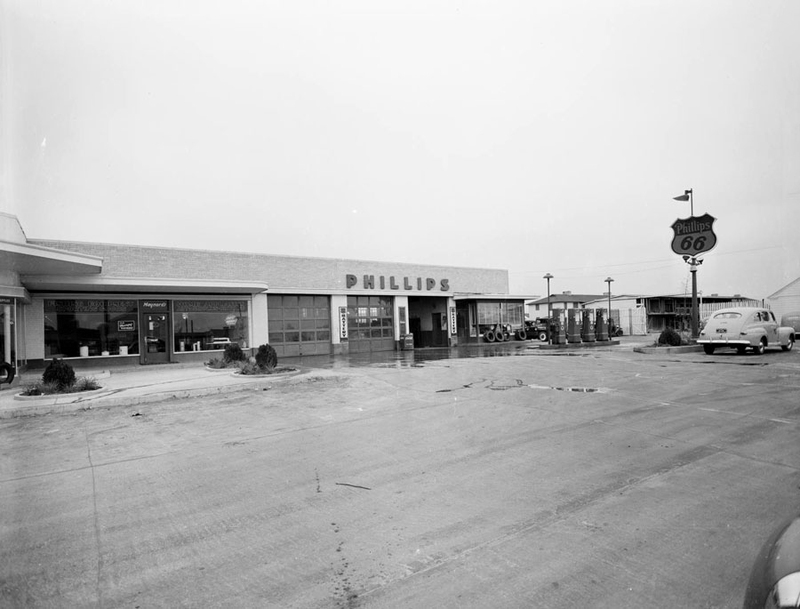 By the late 1940s Phillips had become active in the chemical business, forming the Phillips Chemical Company, a wholly owned subsidiary that operated a large plant on the Houston Ship Channel. In the 1950s the plant began producing a polyolefin plastic trademarked as Marlex. Wham-O Manufacturing used Marlex in the production of the Hula-Hoop, which became popular in that decade. Also a major supplier of natural gas to interstate pipelines, in 1942 the company purchased more than 250,000 acres in the Hugoton-Panhandle gas field and soon thereafter purchased a 25 percent interest in Panhandle Eastern Pipe Line Company. Although required to divest this stock for regulatory reasons, the company remained a substantial supplier of natural gas to the interstate market. A major legal case, Phillips Petroleum v. Wisconsin, reached the U.S. Supreme Court in 1954. The Court ruled in this case that the Federal Power Commission (FPC) had the authority to regulate the wellhead price of natural gas produced for the interstate market. This decision had far-reaching implications for that industry. Phillips continued to extend its operations internationally and explored for petroleum in Venezuela, Canada, and Columbia and later in the Middle East. In Alaska it participated in an exploration and production project at Cook Inlet in 1962 and also at Prudhoe Bay on the North Slope. Exploring for oil in the North Sea and drilling eleven dry holes in offshore Norwegian water in two years, Phillips made its most spectacular discovery in 1969 with the massive Ekofisk oil and natural gas field. The company also participated in liquefied natural gas (LNG) projects, including one designed to transport LNG from Kenai, Alaska, to Japan beginning in the late 1960s. During the 1980s a tumultuous merger and acquisition movement buffeted the oil and gas industry. Groups led by T. Boone Pickens, Jr., and Carl C. Icahn sought to acquire the company, but it retained its independence. Nevertheless, its corporate debt tripled, and it was forced to either sell off or shut down some of its fertilizer, carbon black, and synthetic rubber plants. A period of restructuring took place while its international and domestic operations continued to expand. In the 1990s Phillips accelerated its international business activity. In China it entered agreements to produce oil, polyethylene plastic, and Marlex. It also completed its redevelopment plan of the Ekofisk Field. In the late twentieth and early twenty-first centuries Phillips joined the new era of consolidation in the energy industry. It created a joint venture with Chevron Corporation's chemicals and plastics division in 2000 and acquired ARCO Alaska Inc., in 2000 and Tosco Corporation in 2001. Even though its corporate headquarters are now located in Houston, Phillips Petroleum Company's history remains rooted in the origins of the Oklahoma oil and gas industry. Robert Finney, Phillips, The First 66 Years (Bartlesville, Okla.: Phillips Petroleum Co., 1983). Michael Wallis, Oil Man: The Story of Frank Phillips and the Birth of Phillips Petroleum (New York: Doubleday, 1988). Daniel Yergin, The Prize: The Epic Quest for Oil, Money, and Power (New York: Simon and Schuster, 1991). Christopher J. Castaneda, "Phillips Petroleum Company," The Encyclopedia of Oklahoma History and Culture, https://www.okhistory.org/publications/enc/entry.php?entry=PH004.